Antibodies are proteins used by the immune system to identify and neutralize foreign bodies, such as bacteria, viruses or tumor cells. 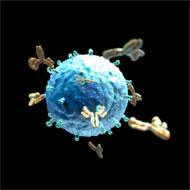 Also known as immunoglobulins (Ig), antibodies are produced and secreted by B lymphocytes in response to the presence of antigens. Antigens are antibodies’ target molecules, which have different chemical structures and can stimulate the activation of the immune system when related to foreign organisms. Each antibody produced recognizes an epitope or specific portion of the antigen. The specificity among the molecules will determine the affinity or force of interaction among them. This specificity also guarantees a more precise action on the target, since, through this antigen-antibody interaction, microorganisms can be directly neutralized or even attacked by other components of the immune system that recognize them. Interestingly, tumor cells produce different types of immunogenic antigens, which trigger activation of the host’s immune system. Thus, in addition to important tumor markers, these tumor antigens are potential therapeutic targets. Monoclonal antibodies (mAbs) are antibodies produced by a single clone of a B lymphocyte and are therefore identical regarding their physicochemical and biological properties. Different types of mAbs can be generated in the laboratory to recognize and bind to the respective antigen of interest. Such procedure was first described in 1975 in an article published in Nature journal (“Continuous cultures of fused cells secreting antibody of predefined specificity”), by the scientists César Milstein and Georges Köhler. For this work, both shared the Nobel Prize in Medicine in the year 1984 with the Danish Niels Kaj Jerne. 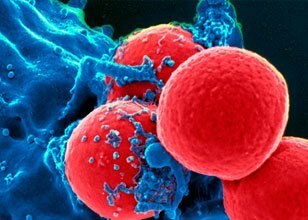 Laboratory-produced monoclonal antibodies are generated from B lymphocytes isolated from mice whose immune systems have been stimulated by the antigen of interest. To improve the production lifetime of mAbs production, isolated lymphocytes are fused to myeloma cells, producing the so-called hybridomas. Once screened and properly maintained and stored, each of these hybridomas can assure the production of a specific, high quality murine mAb. However, because of their murine origin, such antibodies, if used continuously during a therapy, stimulate an immune reaction to the antibody itself, i.e., production of anti-drug antibodies (ADA), which, in addition to inactivating the therapeutic effect, may induce adverse events. For this reason, the use of mAbs was limited for two decades to the production of diagnostic kits or to scientific research. The obstacle of this immunogenicity caused by mAbs began to be circumvented with the advancement of biotechnology and genetic engineering. 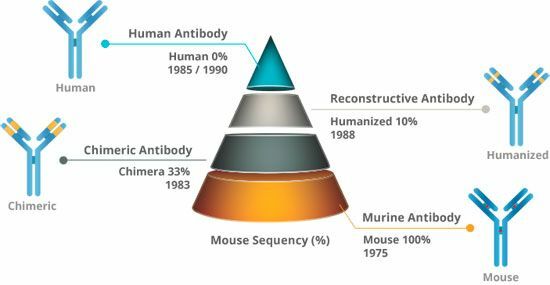 Different strategies have been developed to obtain increasingly "humanized" mAbs, where portions of the murine antibody, which induce immunogenicity, are replaced by human protein sequences. Currently there are several mAbs approved by the FDA as therapeutic molecules that are associated with different levels of "humanization". In general, the premise of the humanization process is to reduce the risk of causing adverse effects without altering the affinity of the antibody for the respective antigen. Currently, it is already possible to create fully human monoclonal antibodies using mainly two distinct techniques, one based on transgenic mice and another on phage display technology (a molecular biology technique which allows the selection and isolation of cloning vectors generated from genomic libraries). For more than 20 years, mAbs have been important in treating many types of cancer. Antitumor mAbs can act through various mechanisms: by direct action, recognizing tumor-specific antigens and modifying host response to malignant cells, or; indirectly in the form of ADCs (Antibody Drug Conjugates), carrying radioisotopes or toxins to tumor cells, broadening its spectrum of therapeutic application. More recently in the area of oncology, a new alternative has impacted the pharmaceutical field a lot and brought innovative results and involves both direct and indirect action of mAbs on the tumor. The checkpoint inhibitors or immune system checkpoints are mAbs, which target molecules that modulate the immune system itself. These molecules, such as CTLA-4, PD-1, IDO, LAG-3, are key safety mechanisms, preventing autoimmune adverse events when immune system cells are acting against a disease or infection. It has been found, however, that tumor cells often use these checkpoint molecules to suppress or evade the attack of the immune system, remaining "invisible". In this way, the use of immuno-checkpoint inhibitors aims to overcome one of the main forms of cancer defense. In 2011, the first immuno-checkpoint inhibitor, anti-CTLA-4, was approved by FDA for metastatic melanoma patients and since then new indications and other targets have been evaluated. However, there is much room for innovation and improvement, especially in the development stage of these drugs, which directly reflects the cost of treatment. In Brazil, ReceptaBio is developing an immunotherapeutic mAbs project with great potential for the cancer treatment and that includes conducting clinical trials in the country. Ongoing clinical trials with these Mabs are being conducted by Agenus, a ReceptaBio partner in the United States, and registered at clinicaltrials.gov as: NCT02694822, NCT03104699, NCT03411473 and NCT03495882. In addition to previous recognition by Science magazine as the "Breakthrough of the Year" in 2013, immunotherapy received the Nobel Prize in Medicine in 2018 through two researchers, James P. Allison and Tasuku Honjo. The first, American, played an important role in the studies of anti-CTLA-4 molecules and the second, Japanese, played a role in the development of anti-PD-1 compounds. De Groot A.S.; Scott D.W. "Immunogenicity of protein therapeutics". Trends in Immunology. 28: 482–490. Weiner GJ. “Building better monoclonal antibody-based therapeutics”. Nat Rev Cancer. 2015 Jun;15(6):361-70. doi: 10.1038/nrc3930.